The HBIPS measure set is unique in that there are two distinct Initial Patient Populations within the measure set, one for the discharge measures (HBIPS-1, HBIPS-4, HBIPS-5, HBIPS-6, and HBIPS-7) and the other for event measures (HBIPS-2 and HBIPS-3). The HBIPS Discharge Topic Population is defined as patients discharged from the hospital with an ICD-9-CM Principal or Other Diagnosis Code for Psychiatric Services as defined in Appendix A, Table 10.01 and a Patient Age at Discharge (Discharge Date-HBIPS – Birthdate-HBIPS) >= 1 year. There are four distinct strata or sub-populations within the HBIPS Discharge Topic Population, each identified by a specific age range. The patients in each stratum are counted in the HBIPS Initial Patient Population for discharge measures of multiple measures. 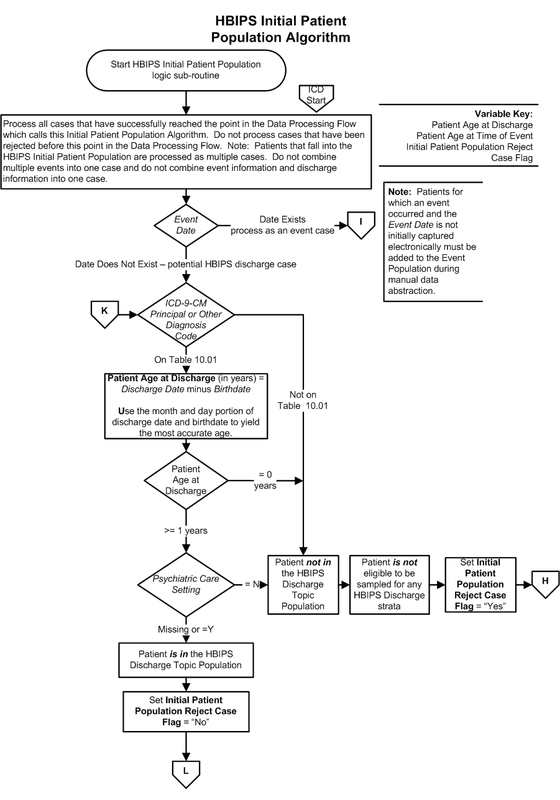 The HBIPS Event Topic Population (common to all HBIPS event measures) is defined as patients with an event (Event Date exists) while they are in the hospital with a Patient Age at Time of Event (Event Date – Birthdate-HBIPS) >= 1 year and the patient was in a Psychiatric Care Setting (=’Y’) when the event occurred. There are four distinct strata or sub-populations within the HBIPS Event Topic Population, each identified by a specific age range. The patients in each stratum are counted in the HBIPS Initial Patient Population for event measures of multiple measures. Patients for which an event occurs (Event Date exists) while in a Psychiatric Care Setting (=’Y’) in the hospital are included in one of the Strata Initial Populations for the event measures. There is no sampling for the HBIPS event measures. 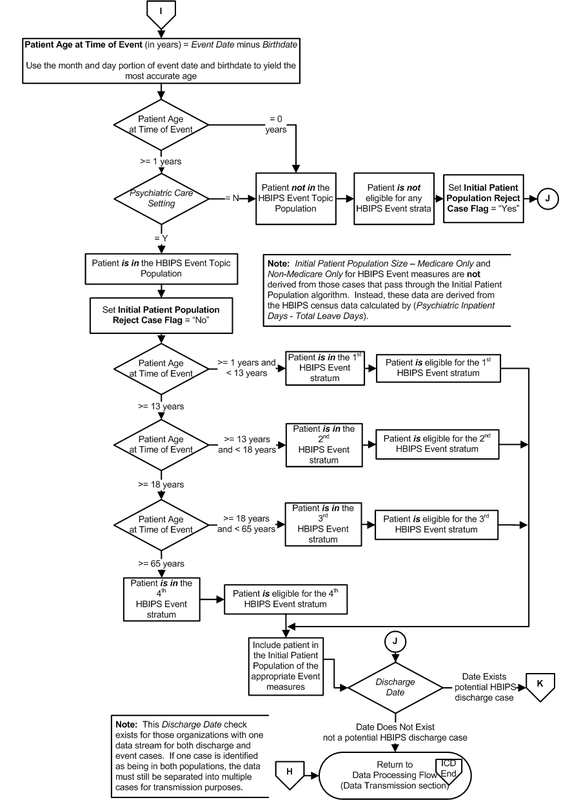 All patients in the Initial Population for HBIPS event measures are automatically sampled. Note For Joint Commission purposes, the HBIPS measure set is not included in the aligned Global Sampling methodology. All patients meeting the definition of the HBIPS Initial Patient Populations are eligible to be sampled, abstracted, and transmitted to the Joint Commission’s Data Warehouse. Hospitals that choose to sample have the option of sampling quarterly or sampling monthly. A hospital may choose to use a larger sample size than is required. Hospitals whose Initial Patient Population size is less than the minimum number of cases per quarter/month for the stratum cannot sample that stratum. Regardless of the option used, hospital samples must be monitored to ensure that sampling procedures consistently produce statistically valid and useful data. Because the sample for a measure set will rarely be equal to the effective sample due to exclusions and contraindications, hospitals selecting sample cases MUST submit AT LEAST the minimum required sample size. Select within each of the four individual measure strata. The effective quarterly sample size within a stratum is at least 44 cases per quarter. Cases are placed into the appropriate stratum based upon the patient’s age. The required quarterly sample size is at least 20% of the stratum population for the quarter. Select within each of the four individual measure strata. The effective monthly sample size within a stratum is at least 15 cases per month. Cases are placed into the appropriate stratum based upon the patient’s age. The required monthly sample size is at least 20% of the stratum population for the month. 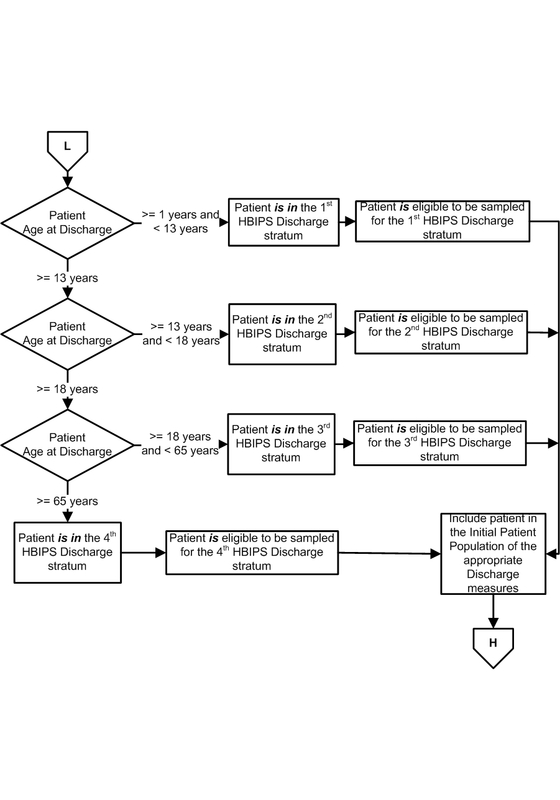 All sampled strata in HBIPS should be used in the calculation of all HBIPS discharge measures. All of the HBIPS discharge measures' specific exclusion criteria are used to filter out cases that do not belong in the measure denominator. Using HBIPS-1b as an example, include cases covering all sampled strata, although the measure-specific exclusion criteria would only allow cases with an age of 1 year through 12 years to be included in the denominator. When applicable, larger hospitals must also abide by the required quarterly sample sizes for the four individual measure strata a minimum of 44 required sample cases per stratum when Initial Patient Population size is 44 or greater. The HBIPS Initial Patient Population sizes for a hospital are 5, 100, 221, and 876 patients respectively per quarter. The required quarterly sample sizes would be 5, 44, 45, and 176. The 1st stratum is less than the minimum required quarterly sample size, so 100% of this stratum is sampled. The 2nd stratum has 100 patients per quarter, which falls in the average quarterly population size of 44 to 220 patients, so 44 cases are sampled. The 3rd stratum has 221 patients per quarter, which requires a 20% sample size, of 45 cases (twenty percent of 221 equals 44.2 rounded to the next highest whole number = 45). The 4th stratum has 876 patients per quarter, which is more than the maximum condition, so a minimum of 176 cases are required to be sampled. When applicable, larger hospitals must also abide by the required monthly sample sizes for the four individual measure strata a minimum of 15 required sample cases per stratum when Initial Patient Population size is 15 or greater. The HBIPS Initial Patient Population sizes for a hospital are 5, 45, 294 and 400 patients respectively in July. The required monthly sample sizes would be 5, 15, 59, and 60. The 1st stratum is less than the minimum required monthly sample size, so 100% of this stratum is sampled. The 2nd stratum has 45 patients per month, which falls in the average monthly population size of 15 to 75 patients, so 15 cases are sampled. The 3rd stratum has 294 patients per month, which requires a 20% sample size, of 59 cases (twenty percent of 294 equals 58.8 rounded to the next highest whole number = 59). The 4th stratum has 400 patients per month, which is more than the maximum condition, so a minimum of 60 cases are required to be sampled. The measures HBIPS-2 and HBIPS-3 are not eligible for sampling and will use the entire Initial Patient Population for reporting. Questions? Ask Question to Joint Commission staff Copyright © 2013 by The Joint Commission.